To me, Christmas is as much about Star Wars as it is about Santa Claus, snowmen, and soaking my bare feet in a trough of eggnog. The Force Awakens might be the first Star Wars movie to be released in time for the Winter Solstice, but for me it feels completely natural that it should be coming out a week before Christmas. Growing up, the anticipation of my Christmas presents was all about which ships or figures I'd be adding to my collection. For me it wasn't a collection of toys, but a palette of story elements. I loved a playset in particular, and the year I got the Imperial Attack Base and Hoth Turret was one of the most memorable Christmases I ever had. It was like being given a whole new movie set in which to direct scenes. I may be a man of semi-advanced years, but my list to Santa this year is, once again, all toys, and books, and tat, that has been slapped with a Star Wars logo. I know I'm being exploited, I know I've got nowhere to put it all, and it's vaguely undignified for someone of my age, but it's a relationship that I enter into gladly. I might be far too mature and embarrassed to actually get down on the floor and play with toys, but I still get the same buzz when ripping apart a blister pack. It's tangible. Profound. It's a time machine fuelled by fat blobs of emotion. The truth is, growing up it wasn't just Christmas that was all about Star Wars; it was life. I was six when I first saw A New Hope – just plain Star Wars back then. Like so many my age, it went deep. Like, thermal exhaust port deep. It was properly destiny-changing, chronologically the second major event in my life after being born. I've often wondered how I'd have turned out had Star Wars never happened, how I'd have developed differently in a Star Wars-less universe. But if the movie had a big effect on me, the toys compound that effect into a life-long obsession, etching it into my DNA. Without Star Wars toys I wouldn't even be a writer. I know that for certain. They sparked my imagination, and made it burn bright. My days at primary school were spent waiting to get home, planning out the stories I'd be telling with my figures when I got back. Chewbacca was my first Star Wars figure, and the best toy I ever owned, bar none, was my cardboard Death Star. I had the usual toy cars, but I used them to mark out the walls and corridors of Imperial bases. A stool my parents kept in their bedroom became Princess Leia's blockade runner. I told a long-running adventure about the quest for an amethyst which focused the Force, long before I'd heard of Kiber crystals. So, given all this Star Wars love, you'd think I was really looking forward to Star Wars Battlefront. Unfortunately, it's just a reminder of how video games have yet to give me the Star Wars experience I've always wanted from them. In some respects, it's a slap in the face, the laziest possible thing you could do with the Star Wars license. A multiplayer, online, shoot 'em up. I know that Battlefront has come in for a lot of stick because it lacks a campaign mode, but a Star Wars game that's just a war simulator utterly baffles me. On paper, Battlefront is basically a game for people who used to play with Star Wars action figures. Becoming part of the titular star war, fighting against the Rebels, or the Empire… all that juicy stuff. But Star Wars was never about the battles for me. Not a bit. I loved those action beats, but it was the character moments, the romance, the humour, the sweep of it which won me over as a kid. Star Wars was built up from Joseph Campbell's tenets of mythology, Lucas working from The Hero of a Thousand Faces to give us a modern myth, a modern fairy tale. Action is a part of Star Wars, but not its entirety. 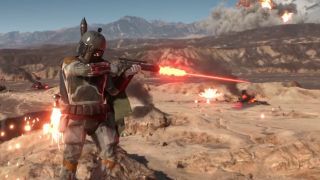 Distilling Star Wars down to one element – the battles – is like releasing a Star Wars kissing-your-sister simulator, or a holographic chess game, or a… well, a Star Wars movie where the fights don't have any actual emotional weight to them. You know: like they had in the prequels. Battlefront might tickle emotional responses with its sights and sounds, but it's never going to engage me in the way I want to be engaged by Star Wars. I want to be at the heart of an epic story. Admittedly, when I played with Star Wars figures as a kid I didn't have a lot of choice but to stage stories, rather than battles – I only ever had a couple of stormtroopers, a TIE fighter pilot, and a snowtrooper, so it was hardly a grand galactic army. Star Wars may mean something different to everyone who enjoys it, but story is what it meant to me. In my eyes, the lack of a campaign mode in Star Wars Battlefront feels like it's missing the point of Star Wars itself. It's a waste of technology, the waste of a grand mythology, to merely spend it on yet another game where we shoot at one another.